Spending New Year’s Eve in Berlin can be a bit difficult – or at least ‘demanding’. There are some Berlin traditions and rituals that are probably a bit different from other cities’ traditions and rituals – so you better be prepared if you are planning to be in Berlin around the turn of the year. First of all: December 31st is not a public holiday – but January 1st is. So people basically have to go to work as usual on New Year’s Eve – and basically all the shops should be open as if it was a common weekday. But some shop keepers may decide to close their shop earlier. And grocery shops might also run short on stock – so it can happen that you won’t find your favorite products if you happen to decide to go shopping on the very last day of the year. 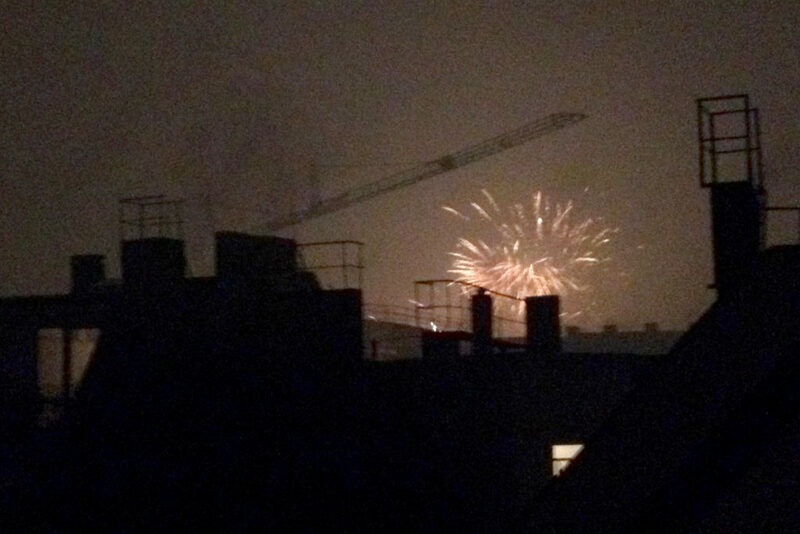 Another important detail about New Year’s Eve in Berlin is that some people love to burn / light their very own firework. This may or may not basically include anything and everything from small firecrackers to rockets – swirling, howling, glowing things flying through the air. Some Berlin areas like Kreuzberg, Neukölln and Wedding are infamous for more or less spontaneous fireworks – in the streets, that might look like serious street-fighting. Some rockets may fly not vertically into the skies, but vertically, down the road. ANd this can actually go on for hours, or even days. Usually the ‘New Year’s Madness‘ begins already in the afternoon / early evening of December 31st – in some areas firecrackers may be heard also prior to that. The ‘hot hour’ would be around midnight. I would strongly recommend to at least try to be where you want to spend your evening a couple of hours before midnight – and stay at least until 1 o’clock. Most people will probably either visit friends, or invite people over to their place to celebrate the turn of the year together in some cozy and comfortable atmosphere. These ‘get togethers’ can be small dinner parties with only a couple of people attending, or full blown parties with dozens of party guests showing up. Most Berlin bars, clubs and restaurants will be open – some will have a special program for the last night of the year. Be sure to check the conditions well in advance – you might want to make a reservation and/or buy tickets well before New Year’s Eve. The same applies to restaurants. Every year Berlin is hosting one of the world’s largest New Year’s Eve parties – if not the largest New Year’s Eve party. The event takes place ‘downtown’ Berlin-Mitte on an area over two kilometers long, between two renowned landmarks: the Brandenburg Gate (Brandenburger Tor) and the Victory Column (Siegessäule). With around one million visitors, dozens of artists, bands and DJs the New Year’s Eve Party on “Strasse des 17. Juni” is Berlin’s most popular party on that special night. As this is Berlin you are of course allowed to drink alcohol – outside. But be aware: you are not allowed to bring your own bottles. So you better be prepared and either bring that champage in a plastic bottle, or bring enough cash and buy your drinks at one of the many “bar booths” that will be located along the party corridor. And additionally you should also not bring any fire works. There will be light and laser performances as well as spectacular midnight fireworks provided. And as of 2015/2016 you are also not allowed to bring large bags or backpacks with you – for security reasons. As I mentioned above, in Berlin it is quite common to visits friends on New Year’s Eve. Traditionally most people are having some kind of buffet – potato salad and Wiener sausages are probably on the top list of alomst every New Year’s Eve party. And people might drink quite some amount of alcohol. Sparkling Wine, Champagne and Crément are a ‘must’. Some people may want to begin the new year with some Sparkling Wine, Champagne and Crément – but that’s not for me. Instead I do believe in the ‘fish theory’ and have mayself some Hering and/or Salmon for breakfast. And since almost all shops are closed and basically the hole city is suffering a hangover, there is no reason to leave home. Instead I recommend to have an all–day brunch buffet and see what the TV has to offer. As I mentioned earlier: I wouldn’t recommend walking some busy street around midnight. In general you should be careful about what is happening around you. People may throw firecrackers and/or fireworks at each other – keep your eyes open. The good news: on New Year’s Eve Night public transport basically runs all night through – every 5 to 15 minutes. That accounts for most of the U-Bahn, S-Bahn and Tram lines as well as most of the Metro buses. So getting around using Berlin’s public transport should not be a problem. Probably the most comfortable way to get around on the year’s very last night is by Taxi – but be prepared that you might not be the only one who wants to catch a cab. Read on about TAXI in Berlin. And what do people say to each other? You can say “Guten Rutsch!” in advance – but on News Year’s Eve you would rather say “Frohes Neues Jahr” which would mean “Happy New Year!”.